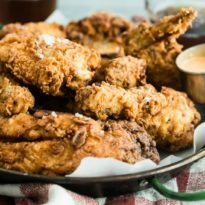 Fried chicken can be so easy to buy these days, but it doesn't hold a candle to honest to goodness, mouthwatering, homemade fried chicken. If you’ve never made it yourself, then it might be time to scratch it off your bucket list and get frying. This classic recipe is the real deal with a golden, crunchy buttermilk batter that tastes great hot or cold. In a deep fryer or electric skillet, or in a large saucepan with a clip-on thermometer, heat oil to 325 degrees. Cut chickens apart into 4 breasts, 4 thighs, 4 legs and 4 wings. Set aside. In a large bowl, whisk together flour, 5 tablespoons salt, 4 tablespoons black pepper, garlic powder, onion powder and cayenne pepper until blended. In a second large bowl, add buttermilk. Place next to bowl with flour mixture. Starting with the chicken breasts, lightly dust with flour mixture. Dip in buttermilk, shake lightly to remove excess, and return to flour mixture. Firmly and thoroughly press and pinch flour mixture on to chicken (the chicken must be well-coated for the best possible crunch). Place in hot oil. Repeat with remaining chicken pieces and place in hot oil in this order: thighs, legs, wings. There should be 16 pieces of chicken in hot oil. Set a timer for 15 minutes. When the timer expires, use an internal thermometer to check the temperature of the breast (it should be 165 degrees or higher). Remove chicken from oil and drain on paper towels. Cool 10 minutes before serving.